Niger's President Mahamadou Issoufou has been re-elected for a second term by a landslide in a controversial run-off vote, official results show. The electoral commission says he received more than 90% of the vote in Sunday's polls, which the opposition had boycotted. Opposition challenger Hama Amadou, who was flown to France last week for emergency medical treatment, took 8%. The official turnout figure was 60%, disputed by the opposition. Is Niger poll vital to Boko Haram fight? The opposition coalition, Copa 2016, puts the turnout at 11%. It had already said that it would not accept the result, alleging voter fraud and complaining that its candidate had been unfairly treated. 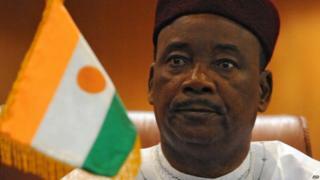 Addressing media in the presidential palace, Mr Issoufou called for national unity, which he said was vital in the country's battle against terrorism, BBC Hausa's Ishaq Khalid reports from the capital, Niamey. During the first round last month, Mr Amadou campaigned from prison. He was being held on baby trafficking charges, which he denies, arguing they are politically motivated. The opposition boycotted the run-off complaining of unfair treatment of their candidate and have already said that they would not accept the result. The country is rich in natural resources, including uranium and oil, but is one of the world's poorest countries, ranking last in the UN Human Development Index.